When clean fresh-smelling clothing goes into the dresser, and unclean musty smelling clothes comes out, it's both frustrating and inconvenient. 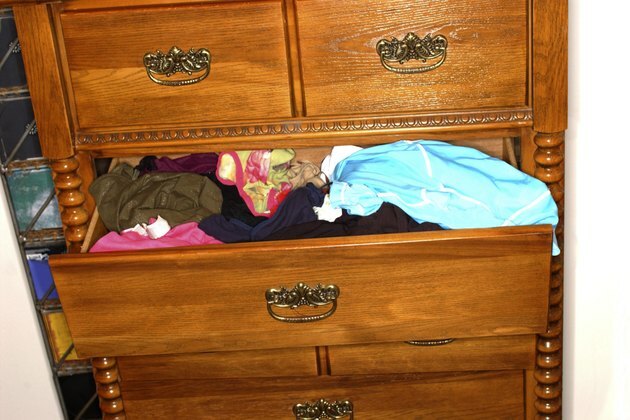 Whether the clothing or the dresser caused the smell, it becomes an endless cycle until it's taken care of. Since no one wants to wear musty-smelling clothing, this is a problem that requires prompt attention. Clothes should smell clean coming out of a dresser. Musty smells are the result of mildew in your clothing or in your dresser. Mildew spores accumulate in dark and damp environments, and even if we can't see them, the smell gives them away. Moisture often finds its way into the drawer, usually by means of damp clothing, but it may also be the result of spills or humidity. Mold and mildew spores can aggravate respiratory problems such as asthma and even cause irritation to the skin, so it's not a problem to take lightly. With mildew spores potentially in the clothes, it's best not to take any chances. Get the clothing outside and shake it off as you visually inspect the items for noticeable signs of mildew and mold. If you discover any, brush it away with paper towels and treat the stain with lemon juice. Allow it to air-dry in the sunshine before laundering. For clothing that smells but has no visible signs of mildew, air it out for two to three hours in the sun before laundering. Add 1 cup of white vinegar in with the clothes as they wash to help kill the odor. Now that the drawers are empty, remove them from the dresser and take them outside. Hold each drawer upside-down to shake out any dust, dirt and debris. If you see any mildew, brush it out with a paper towel or brush. Wipe down the inside of each drawer with a wood soap and leave it outside to air-dry in the sun. Sunlight and fresh air are great for helping to get rid of smells. Give the drawers a few hours to air out before bringing them back inside. To avoid future musty smells, always wait until clothes are completely dry before putting them away. If you live in a humid area, keep the drawers open a crack and set a dehumidifier nearby. Keeping a small dish or box of baking soda in the dresser is useful to absorb not only odor but any moisture as well.